Maccaferri France provides retention and infiltration basins made out of a Terramesh system, Reno Mattress and combination gabion solution for a project in Rhone. Recently, a project in Rhone (France) required retention and infiltration basins made up of combination solution using a Terramesh system, Reno Mattresses, and Gabions. The development site in question had experienced infiltration by storm water since last summer (2015) and thus experienced the need to renovate the already existing retention basins. To elaborate further, the city wanted to increase the capacity of the existing basins by using new water proofed surfaces as the construction of a college and an additional zone of activity will be built in the future on this development site. The retaining walls of the basins are actually reinforced soil slopes featuring our Terramesh system, a structure consisting of a gabion facing and continuous reinforcement in double twist mesh with an additional polymeric coating, designed to ensure a continuous connection between the facing and the support. In the case of this project, the Terramesh system has been combined with a primary geogrid, Paragrid 100, certified Asqual. 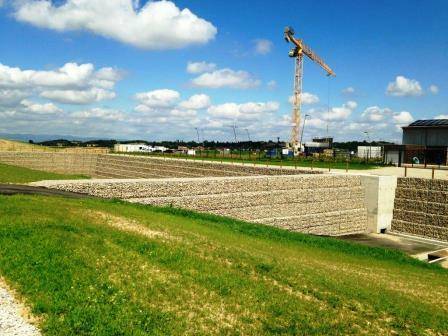 The retaining walls were designed according to the NFP 94 270 standard, by Maccaferri France’s engineering team using Maccaferri’s advanced design software that was. The two basins are separated by a mass gravity retaining wall made of woven double twist gabions. Impermeability is provided by a cast concrete diaphragm at the interface between the two walls. 30cm thick Reno Mattresses, with a polymer coating, were installed within the structure to provide scour protection over a length of 70 meters in the infiltration basin located downstream. In these hydraulic applications, the use of flexible the double twist steel wire mesh is important and the polymer coating provides durability and a long design life. These works, which will perfectly integrate themselves into the surrounding environment, will have a large storage capacity, as required by the municipality. For further technical details, please download the Case History present in French language. For more information, please contact our French Subsidiary.